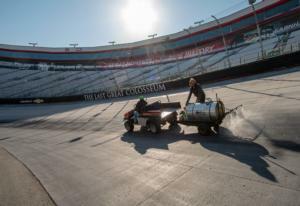 Bristol Motor Speedway officials announced today that the application of the traction compound to the lower groove, what many in the industry now refer to as "Bristol Bite", will again be utilized for the 2018 Food City 500 weekend. This is the fourth consecutive race weekend that the Speedway is using the innovative track prep process on the bottom groove of the half-mile, concrete oval, giving drivers multiple options as they navigate around The Last Great Colosseum. Feedback has been positive from fans and drivers alike, including 2017 Bass Pro Shops NRA Night Race winner Kyle Busch. "Now that they have the bottom groove going back again, that seems to open it again for the bottom and the top," said Busch, who has 20 wins at BMS across NASCAR's top three national series. "You can run two lanes, and you can have the lanes be more equal to one another, rather than the top just being so much faster and having to run up there." On-track action at Bristol Motor Speedway begins this Friday with Bush's Beans Pole Day, which features practice for the Monster Energy NASCAR Cup Series and NASCAR XFINITY Series as well as exciting knockout qualifying for the Food City 500. The evening will end with Food City Family Race Night, one of the longest running and most popular fan festivals in NASCAR. The free event runs from 4-9 p.m. at BMS' Hospitality Village, located outside of Turn 4. The Fitzgerald Glider Kits 300/Zombie Auto 150 doubleheader highlights the docket on Saturday. The Fitzgerald Glider Kits 300 is the first Dash 4 Cash race for the XFINITY Series and Christopher Bell, Daniel Hemric, Cole Custer and Ryan Preece will battle it out for $100,000. The Zombie Auto 150, featuring the upcoming stars from the NASCAR K&N Pro Series, has been increased by 50 laps, providing an exciting climax to a packed day of racing at The World's Fastest Half-Mile. On Sunday, NASCAR's stars take to the battlefield for the Food City 500, one of the most challenging events on the calendar. Busch, Kevin Harvick, defending race winner Jimmie Johnson, Chase Elliott and more will take to the colossal half-mile in the effort to raise the iconic Bristol trophy in Victory Lane. And for families who want to bring the entire clan, Bristol Motor Speedway officials are making it easier than ever for kids to have an awesome experience. Kids' tickets (12 and under) are free and adult tickets are $10 for Friday's (April 13) Bush's Beans Pole Day. On Saturday (April 14), kids' tickets are free and adult tickets start at $35 for the Fitzgerald Glider Kits 300 NASCAR XFINITY Series race and the Zombie Auto 150 NASCAR K&N Series event. On Sunday (April 15) adult tickets start at $70 for the Food City 500 and kids' tickets are $10. For all races, each child must have a physical ticket in hand to enter the gates. The Bristol Motor Speedway ticket office is the only authorized location that can produce the free kids' tickets. To purchase tickets to the Food City 500, please call 423-BRISTOL or buy them online at www.BRISTOLTIX.com. Tickets can also be purchased directly from any neighborhood Food City store through April 10.